Marc Marquez (Honda) won his most recent MotoGP title (his 5th) while riding with a shoulder that was very seriously damaged, which was able to pop out “in all directions” according to surgeon Dr. Xavier Mir. Mir performed surgery on Marquez earlier this week on both bone and ligaments to stabilize the left shoulder joint of the world champion. Reports indicate the prognosis is good, and Marquez states on his Twitter page that he is feeling better, although he appears to need the entire break between now and the first MotoGP test of 2019 at Sepang beginning February 6 to recuperate, and be able to ride a MotoGP machine. 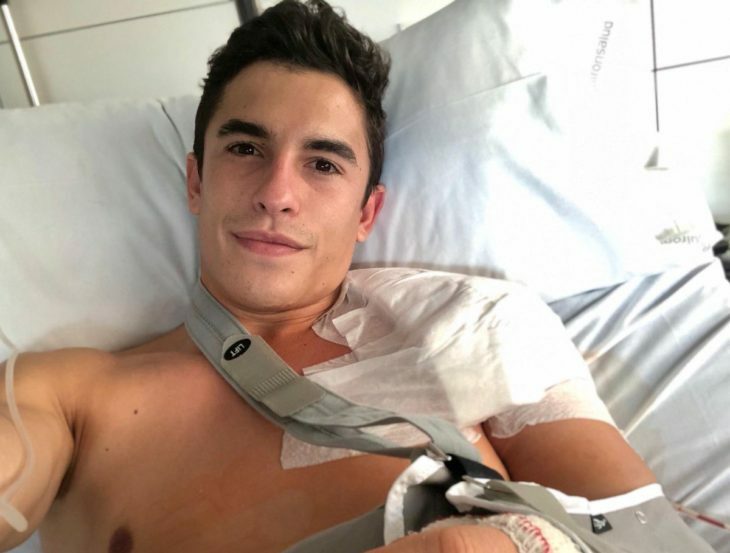 His new Repsol Honda teammate Jorge Lorenzo also underwent surgery this week … on his right foot that was injured during a crash late in the 2018 series. Compared to Marquez, Lorenzo’s surgery appears to be minor. His comment to his Twitter photo below indicates he is feeling well and already training. Aww, man! He’s a spammer? And I was getting pumped about visiting his bloog! Tһanks for helping out, excellent infgo . Gettin’ old ain’t for sissies. Nice to see a picture of MM where he isn’t sticking his tongue out ! Wish then both a speedy recovery..
It’s hard to actually call the shoulder a joint. Very hard to really fix. He’s got the best in the world (hopefully) repairing and rehabbing. These guys are tough as nails and really LOVE what they do. Good luck kids. If we look at Rossi, yes we see the bike is not up to par, but we also see age and injuries catching up to him. He once said it is more difficult to get out of bed in the morning and get ready to race, physically. Mentally he is there but physically he cannot risk falling like he used to. Our bodies physiologically reach peak form somewhere around 30. Starts downhill from there. Just the facts. At Sepang, when Marquez, was slowly catching Rossi, Rossi seemed to fall because of that. How much the tables have turned, when in the past, it was Rossi who would pressure the leaders late in the race, causing THEM to crash. Have we seen the peak of Rossi? How much longer will Rossi continue to be competitive. What a great man, great achievements from him, but is the door now closing for him? Some forums wont even mention it. But you have to admit it is impressive how well Rossi is still doing. No one else is out there at his age and there are a bunch of young guns who cant match his performance. Good on him, keep going for us old guys!!! Indian Rider, I think you missed the point of Prov’s post, he was merely pointing out how, from his own personal experience, these riders are understating their situation, because they are tough and true athletes. He was complimenting them. woops…this post was meant to be further down the page under Provologna’s. Seems like a lot of power for such a flat seat. Better HOLD ON to those bars. Just shows how tough MotoGP riders are, riding with injuries that would stop most people, they win or keep fighting for the win. Good healing to both of them. Can’t let the boyish looks fool us. This kid is as tough as nails. Jorge too (the collarbone incident in Assen). I hope he recovers well for next season. I understand that shoulders can be tricky to repair and heal. They are tough…Rossi racing with a compound fractured leg, Lorenzo and Pedrosa racing with recently broken collarbones, a lot of guys racing with broken fingers and Doohan and Sheen that were really broken up and still racing? When did he get a compound leg fracture? I don’t remember it being an open fracture. September 2017 in an MX accident (displaced fractures requiring surgery) and June 2010 @ Mugello (this was displaced and exposed). Thanks, didn’t realise that. Even more impressive he got racing again so quickly. I remember a race at Daytona, the 80’s maybe? Miguel Duhamel was racing for the Honda factory, and hobbled up to his bike on crutches! Somehow got his leg over the bike and got feet on the pegs. They took his crutches away and he raced! Don’t remember how he did, but he probably scored a few points for the season. Woof! I remember this, it was more like the mid 90’s. Duhamel had suffered a really bad break the season before, was fortunate to not lose his leg. I remember watching him hobble around the pits on crutches there at Daytona and then he went on to win both the Supersport race and the 200. I’m remembering they either talked about doing, or did, the same thing to Miguel that they had to do to Doohan, stitch the good leg to the bad leg for better blood and fluid flow for better recovery. Doohan would have lost part of his leg if they hadn’t. “Better” is a relative word. “Better” than what exactly, Mr. Marquez? Better than Wiley Coyote being flattened by a semi, maybe? As someone who’s had IIRC 3 knee surgeries and one shoulder surgery, I have to cry “foul” on Marc’s “better” qualification. Shoulder surgery is absolutely a pain, period, no exceptions, AFAIK. I don’t think I slept through a night for about two weeks, maybe more. Getting “comfortable” to sleep was virtually impossible. Way to make it all about yourself…..sounds like you need to toughen up. Some folks have never been injured or been through surgery. Reports from the hospital are always something like this one. You’ll never hear something like Marquez saying that his shoulder hurts like the dickens. But first class doctors provide first class dope. I feel that the message machine should make some effort to turn out something a bit more realistic. I’d love to hear, for once, the truth. It would be much like you put it. But you can’t let the fans think you’re a whiny little girl at their level. When I had may collar bone screwed and glued and whatever 5 years ago, I was on a pain block for 2 days. Holy moly, that thing was cool. I could move my fingers around, bend my elbow… but my shoulder that was being fed by the machine….wow, no matter how hard I concentrated and focused on trying to move even a millimeter, I just couldn’t move it. It was absolutely fascinating to me. And if it weren’t for the pain block, I’d have never gotten any sleep that first 2 days. Yup, I suspect you nailed it. Shoulder surgery can be very tricky. I hope MM returns unscathed, but if I had to bet (I don’t) I suspect negative, he’s not 100% first race next season. No other body joint has such huge range of motion. Nobody rides like MM, being smooth and controlled while riding on the knife’s edge of complete chaos. I suspect he’s not there at the start of 2019. And of course, his doctors, even if Honda pays the insurance bill, are obligated legally and ethically to have warned him his risk is higher now for any future crash. I compared the abject pain of shoulder surgery, which we have in common. What was your pain level after your shoulder surgery? My post surgery pain level was multiples higher than pre-surgery. Of course it’s much better now. On a related topic: a little tip for anyone addicted to caffeine as I was pre-surgery (since quit altogether). Give yourself about one week or maybe longer to quit pre-surgery. Each day lower your caffeine dose about 1/7th. After 7 days you’re at zero and done. You don’t need the caffeine headache on top of all the other misery. The caffeine headache for persons heavily addicted is about equivalent to putting your head in a vice. Real nice with your shoulder feeling like Tyrus is twisting it as far as he can to win a prize! Really, they should warn addicts about this problem pre-surgery. Surgeries aren’t all the same, and neither are shoulder surgeries. Some are very painful afterwards, some are a walk in the park. Having said that i’d be surprised if he’s not playing it down.